When it comes to covers, there’s a lot to cover! we have so many to choose from. Different people have different priorities. Some value safety as the major priority when choosing a cover, some water clarity, and some budget…whatever your concerns, we’re sure we’ve got the answers and the cover for you. Before you choose though, we want to be sure you understand exactly what each cover provides. We put together some important information for you to consider when making your choice. Below, click on the type of cover that interests you to find out which one would be the best fit (all puns intended!). Solar covers are what we call a necessary evil. We don’t like them but find them necessary, particularly if you have a heater or heat pump. In order to maintain heat generated by the heater, you will need a cover. If you elect not to use a cover, or an alternative to a solar cover, you will be paying excessive and unnecessary heating costs…even up to 66% more! Use of solar covers can (literally) cut your heating costs in thirds. Imagine that you’ve heated your pool to 88° (the perfect temperature for me, I might add) and the air outside drops below the temperature of your pool water. What would happen? You would have a beautiful steamy looking lagoon in your backyard, that’s what would happen! You would be seeing dollar signs rise into the air in the form of steam as you so nicely heat the atmosphere! Meanwhile, your heater would be pumping away trying to maintain that temperature to which it’s set. So, unless you like throwing money out the window (or up into the air in this case) you need to consider a solar cover, especially at the beginning and end of each season. We’ve mentioned that we really don’t have a love for solar covers. That’s because they’re awkward and clumsy to handle and a nuisance to store. 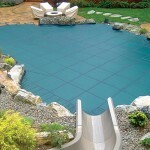 If you have a rectangular pool, or similar, you can always purchase a solar reel to make life easier. We’ve tried many and always fall back on the Rocky Reel. We find the Rocky Reel to be the best quality and worth any extra money. If you purchase a reel that is light weight or maybe doesn’t have a quality rolling system then your reel may sag in the middle and be extremely difficult to utilize, especially for one person. A Rocky Reel will last you well beyond the cheaper version, making it your best value. You may read on the world wide web or hear from others that there are several different solar covers on the market…covers with black backing, silver backing, all clear covers (which yellow, they don’t tell you that), covers with diamond shaped bubbles instead of round…all claiming increased heat retention. However, from extensive research, feedback from actual customers, and testing of our own, it is our opinion that the claims of increased heat retention don’t outweigh the extra expense. Even the largest manufacturer can’t provide rave reviews of these newer alternatives so, in our store, we choose to stick with the simple, tried and true. Don’t be fooled into thinking a solar cover is going to last you a lifetime no matter what the design. In the end, it’s a piece of plastic sitting on chlorinated water and it will degrade. Warranties cover Manufacturer defects such as delamination and seam-failure so put your money into the reel and plan to replace your cover every few years. We’ve stated a reel is good if you have a rectangular pool or the like. What if you don’t? 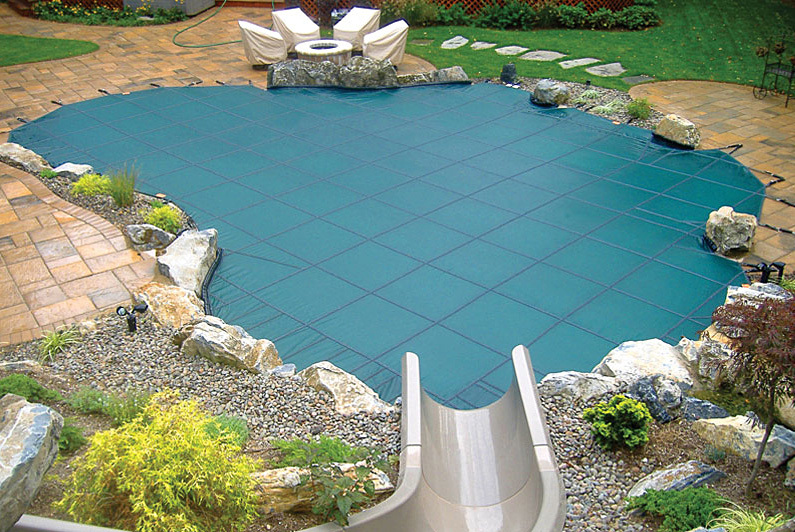 What if you have a crazy shaped pool like ours? What if you have stairs at the end and a diving board at the other end? We suggest you cut your blanket into smaller strips so it’s easier to take on and off. We have ours cut into four pieces because we have a very large pool. You may want to cut yours into two or three pieces. Do whatever makes sense for you to make it easier to handle and easier to store. Storage is important. We’ve already said they don’t last long. If you want to throw your cover away at the end of each season and buy a new one every year then leave it uncovered and in the sun. If not, buy a Solar Shield or get some white plastic to cover your blanket when it’s folded up or reeled up and in the sun. Choose something to reflect the heat or put it in a shady spot if you can. If you don’t, the heat builds up inside the bubbles and generates through the blanket causing the bubbles to pop and your blanket to degrade. If you don’t have a heater and have a sunny yard, you can expect to gain approximately ten degrees from your blanket. If you do have a heater, expect to save hundreds or more in heating costs. Personally, we use our blanket from the time our pool is opened until about Father’s Day then we use Solar Fish Liquid Solar Blanket until the end of August. We then put our blanket back on for fall. Liquid Solar Blanket products do 50% to 70% of what solar blankets do without the hassle. They are non-toxic and form an invisible layer over the top of your pool keeping in the heat you’ve gained from the sun or heating source. This layer is broken up by heavy rain and swimmers and reforms when the pool is still. It’s best to angle your return jet eyeballs downward and remove floats from the pool for best efficiency. Hopefully, you feel better informed on Solar Covers. Feel free to inquire in our store for more information. 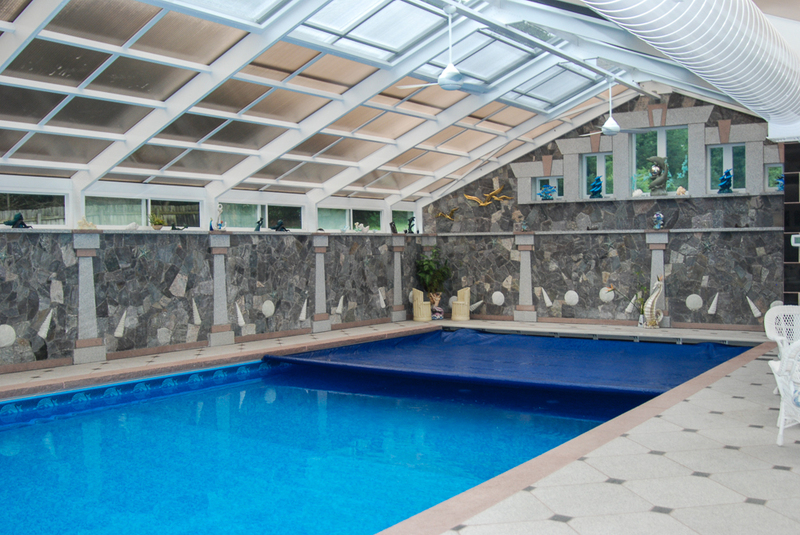 Standard winter covers are for the budget conscious who want to open up to a clean pool. These covers are not superior in manufacture but serve their purpose well if cared for properly. We recommend solid covers. Solid winter covers don’t allow sun in which causes algae to establish and grow while the filter is shut off and no chemicals are being added routinely. Water will accumulate on these covers so the purchase of a Cover Pump is suggested and well worth the money. Of course, you can always siphon. The point is to keep the water pumped off the top of the cover so it doesn’t get so heavy it falls in. Cleaning debris off in the fall before snowfall is beneficial also. So, put your pool away clean and balanced, cover it with a solid cover, keep the cover pumped and cleaned off and chances are that you will open to a clean, hassle free pool. The hassle, of course, isn’t gone completely…it’s just not in the cleaning of the clear pool. Some people have no trouble at all maintaining their solid covers while others struggle a bit. Obviously, if you are surrounded by trees, your task is going to be more laborious. You have to be watchful of your water level while pumping the water off the top of the cover. If you pump off more than a foot of water from the top then you need to replace the water underneath. Remember, water escapes through the tops of your skimmers without your noticing. When the cover sinks in from the weight of water on top, the water under the cover goes out into the ground through the tops of the skimmers. Think about putting an ice cube into a full glass of water…the water pours over the top of the glass. The same thing happens in your pool when all that rain and debris lands on your cover and pushes it into your pool…the water underneath gets pushed out. It’s no big deal, just replace it. Do this while you can until it freezes then let it go until Spring. 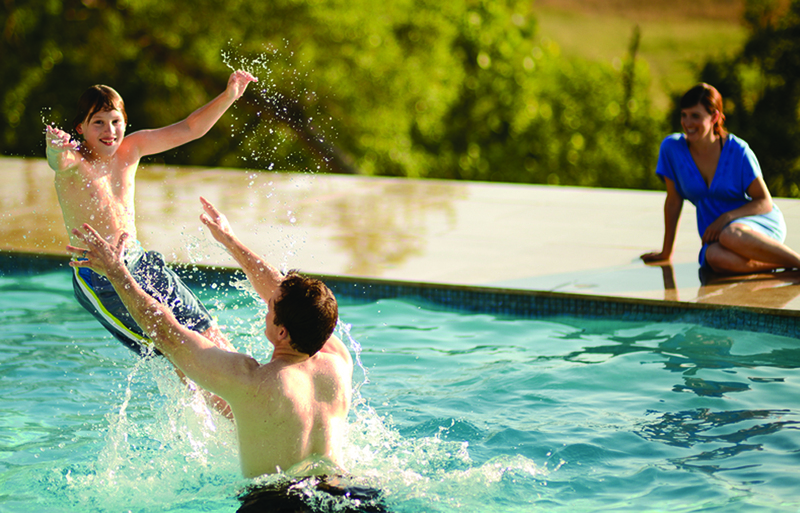 The other hassle may be in the means to keep your cover secured over your pool. Cement blocks are not the answer. Wind gets between them and the cover starts to flap like a sail and, undoubtedly, one is doomed to fall in and do damage to your pool…maybe not this year but possibly next! For this reason, we recommend Water Tubes. Water tubes may not be your favorite solution but they are a safe one and they aren’t expensive. Expect to replace a few each year and you’ll still be at least a grand ahead of what you might expect to pay for a safety cover. Remember, standard winter covers are like solar covers in the respect that they are simply plastic sitting on chemically treated water so expect to replace them approximately every five years. If you see one with a 15 yr, 20 yr, 30 yr warranty, etc. — don’t believe it….even if we sell it! We are an honest pool company—we will always tell you the truth despite what the paperwork may say. Safety covers are a broad subject as they have improved and diversified so much over the past fifteen years. It used to be that you had a standard cover which offered you no safety but kept your pool clean verses a safety cover which offered you safety but left you with a dirty pool come spring. It doesn’t have to be that way anymore. Some things improve with age! There are now a variety of covers from many manufacturers. I can tell you, we’ve tried many and they are not all created equal. We’ve tried covers for lower costs, better color options, superior features but not all companies produce what they sell…if you know what I mean. 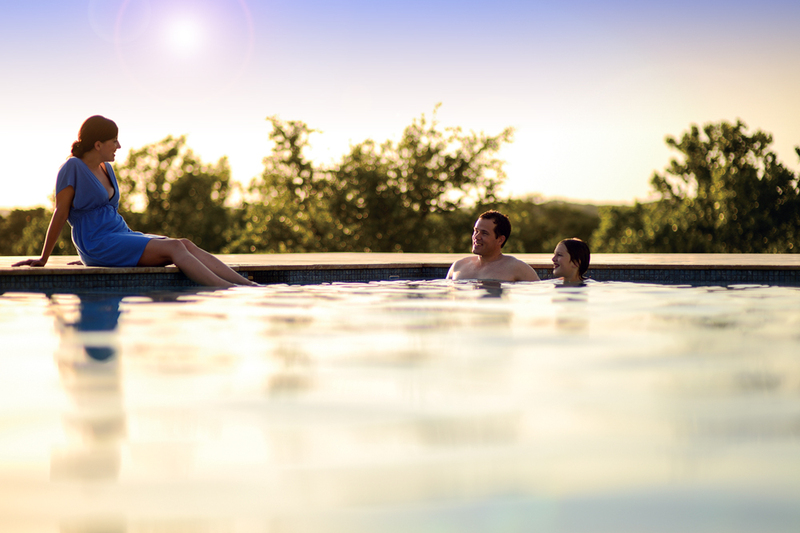 At Family Pools we’ve narrowed our choices to what we believe to be the best manufactured and best backed covers available on the market today. There are pros and cons to each and we are happy to speak with you to find the best suited for you and your lifestyle. Without getting into brand, let us tell you about three specific types of safety covers…standard mesh, a more dense mesh, and solid. All meet ASTM (American Society for Testing and Materials) safety standards and all have a long life span as compared to a standard winter cover. Materials and manufacture of a safety cover cannot compare to that of a standard winter cover, they are far superior. They all attach to the pool decking in a similar fashion. We recommend they all be stored high or safely contained, away from any mice, ants, or critters that might choose to chew on them or nest in them while in storage. The standard mesh is the material used since the inception of safety covers. It is tried and true and makes for a very safe and great quality cover. It is the least expensive of the three. This cover drains the best out of the three, stays taught across the pool, leaves and debris stay dry and blow off it or can easily be removed from it because the debris stays dry. This cover is lighter weight than the others so if you have a brick or paver deck or sophisticated water features that the cover anchors into, there is less tension on the decking or waterfall. The biggest drawback, for some, would be that the cover is mesh in design so sunlight penetrates through it allowing algae to establish and grow in your pool and very fine debris and dust to get in. If you look at the material in person, you will see that it is a very tight mesh so you will not get heavy debris through it. Quite often what you end up with if you close your pool in October and open it by late April, depending on weather, is that you can see down through to the bottom with a layer of fine algae and debris coating the bottom. Depending upon your filtration and its capability to filter out fine particles, your pool could be very easy to clean up or could be quite cumbersome. Feel free to ask us our opinion based on your setup. If you close the pool earlier or open later, the pool could quite possibly be totally green or black. Again, it could clean up easily or not so easily depending upon your filtration. The more dense mesh materials now available, such as Smartmesh or Coverlogix 7000MS, offer you a great improvement in water quality upon opening your pool. They are a great combination of the mesh and solid covers, offering both drainage and sun protection. While they drain slower than a traditional mesh cover and may develop a puddle now and again, this has not been a problem. In fact, we sell over 75% dense mesh covers and both our clientele and our service technicians have been very happy with the results. Lastly, we offer solid covers for those who request them. Unlike standard winter covers which we prefer in solid, we recommend mesh for safety covers. A mesh standard winter cover would sink into your pool leaving an impossible task of removing all those heavy wet leaves before removing the cover, whereas, the safety cover doesn’t due to its strength and design. 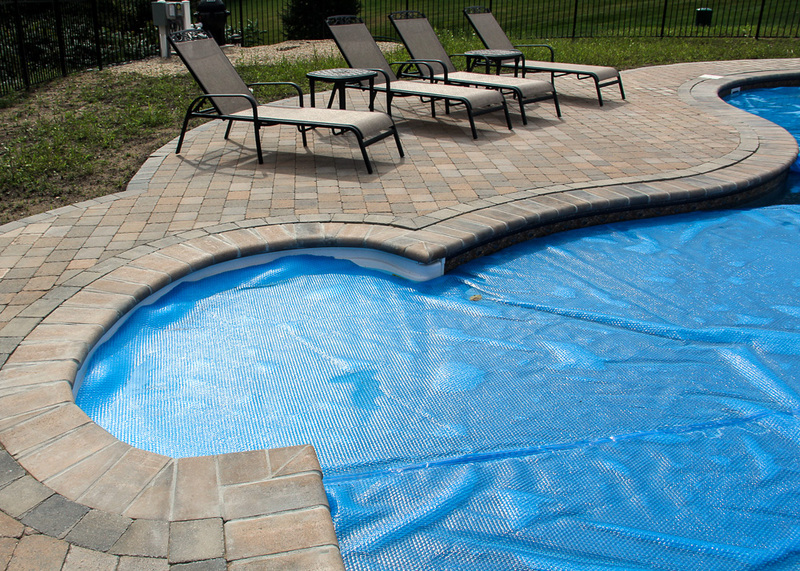 A solid safety cover does have the benefit of keeping your pool totally sun protected and clean, however, it leaves you with a bigger task of cleaning the cover come spring. They also come standard with a cover pump because in order for the cover to remain safe by ASTM standards, the water must remain pumped off the cover. These covers are available with mesh panels in the middle but that defeats the purpose of the all solid cover. Besides all that, we prefer the quality of the mesh materials for longevity. Auto covers are the ultimate in covers. Save energy, save chemicals, save money! Yes, it’s hard to believe with the expense of an automatic cover that we could possibly make the statement “save money” but, in the long run, you definitely will. For starters, you save up to 75% of your heating and chemical costs with a quality automated cover. No accessory for your pool will save you more plus you get the added benefits of keeping your pool clean and safe at the same time. 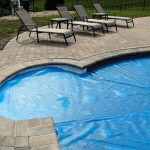 It is, of course, easiest to design and install your cover on a new pool install but you can also add them after the fact. 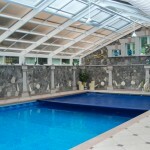 Rectangles are the easiest pools to cover but other shapes can be fitted. 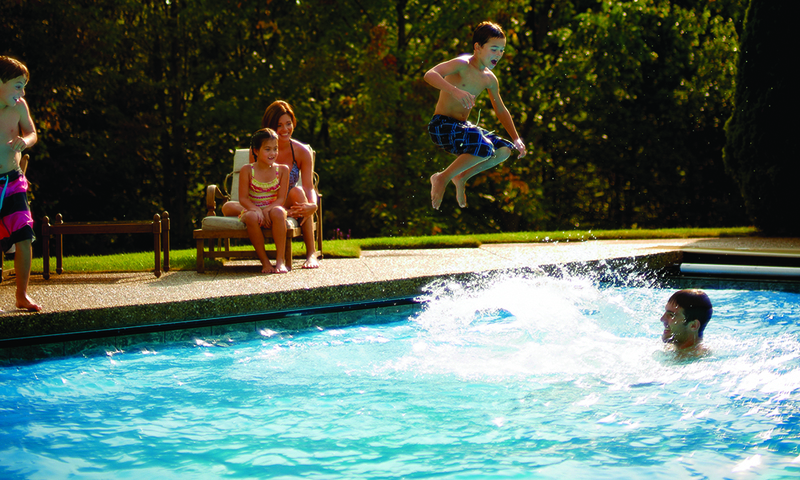 If you’re in the market for a pool restoration or deck replacement, it’s a good idea to inquire. If not but you are still interested in more information, please don’t hesitate to ask. Okay, that covers it for sure!